One of the lesser-known things about me is that I love city builders almost as much as I love JRPGs. 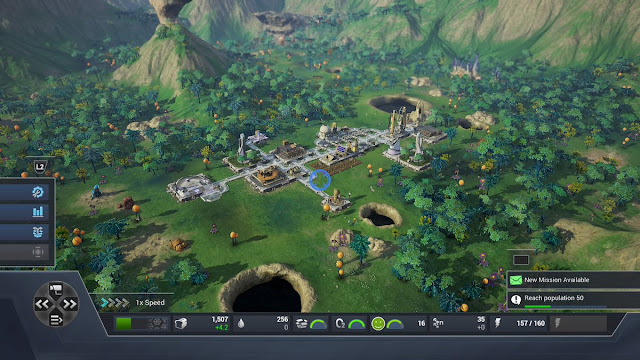 I don’t get to talk about the games as much, as I generally play games on console these days, and it’s rare for city builders to be released on console, but I did spend a lot of time with Tropico 4’s PlayStation 4 port, for example. A lot of time. If I get hooked on a city builder, the time I spend tweaking my cities and trying alternative strategies dwarfs what I would spend in almost any JRPG. Cities: Skylines is coming to PlayStation 4 later in the year, and it’s going to be one of those games, I suspect. In the meantime, though, I’ve got Aven Colony to play, and based on what I’ve seen so far, this is a game that deserves far more interest than it’s currently generating. This game is superb. The basic premise of the game is that you’re the mayor/ city planner in charge of building humanity’s first home away from earth. Starting with a tiny colony of people, the goal is to slowly, but sustainably, build the colony into a thriving metropolis, all the while keeping the citizens safe; from one another, from the creatures that inhabit the planet, and from the elements itself. Many of the features in this game will be instantly familiar to anyone who has played a city builder before. There are some basic economics to manage; your people need to survive, so they need food and water, and they work so that you can have the resources that you need to build more buildings and add yet more facilities and people. 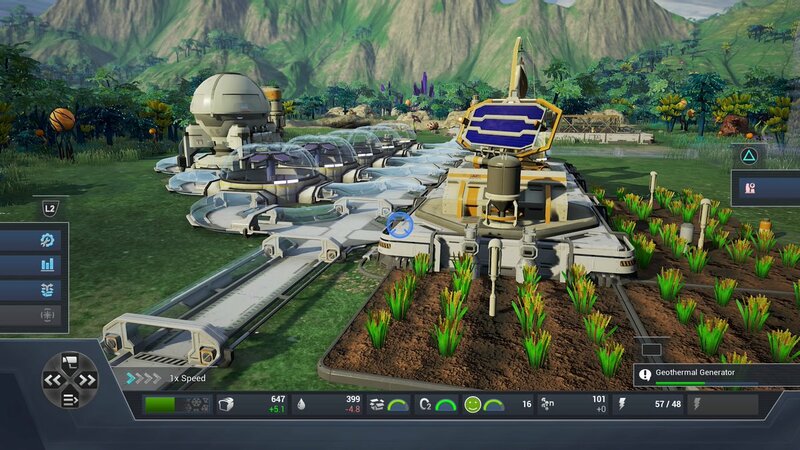 In the early going Aven Colony’s colonies are like utopias, where the tiny population are all fed, happy, and employed, but scale is always the problem, and keeping everyone in line, employed, and happy become an ever more challenging task the more people that are in your city. 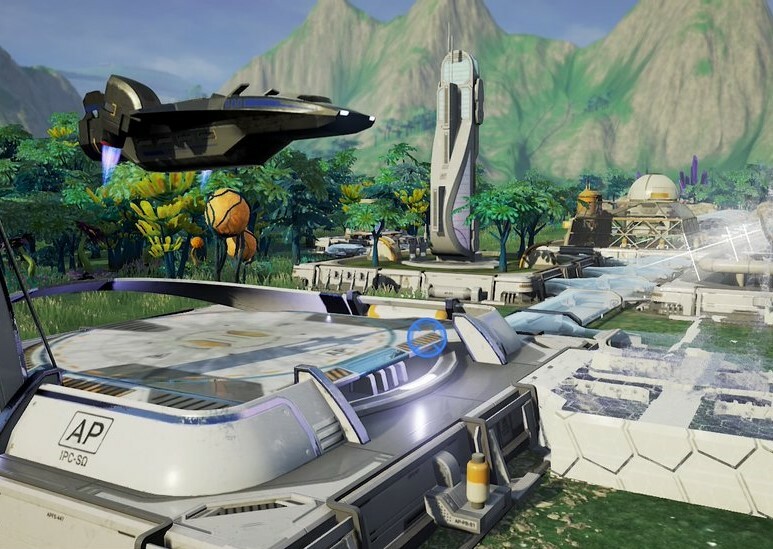 Then there are a couple of additional challenges that are more unique to Aven Colony and help sell its science fiction nature. For one thing, the very air on these new planets is hostile, so the people can only live and work in domed facilities, and roads are replaced by covered passageways. While also giving the game a different aesthetic, this turns oxygen and air quality into a critical resource that needs to be managed. Other city builders have air pollution, but in Aven Colony, the quality of the air degrades much more quickly if you don’t stay on top of building air filters and the like as well. There are of course dozens of buildings to construct - from mines and residential towers, through to recreational parks, stadiums, and immigration centres (which is how you grow the population of the city. There are some defensive buildings you can construct too, to help deal with the natives or other disasters, As always resources are limited, and this is especially true in this game because you will be spending a lot of time preparing for winter every year. Once winter hits solar power panels are less effective, farms stop growing crops, and if you haven’t managed the city well, the ensuring drain on resources when the city can’t produce much can be catastrophic. My solution, so far, has been the slow and expensive one; I build greenhouse farms (which don’t create as much food, but can keep generating food through winter), and batteries to store excess solar power during the warm months. Then, when winter hits and power generation slows down, I let these batteries kick in to continue powering the community over that period of time. But, as I said, this is the expensive way to do things, and I’ve got no doubt that on the harder difficulty settings it’s a trick that I won’t get away with. I’ve only plunged around a dozen or so hours into the game so far - playing the tutorials, and the first two “story” missions. “Story” is a bit of a misnomer, as it’s really just specific scenarios and objectives with some sub-objectives thrown in. In other words, it’s just like the sandbox mode, only slightly more focused. But that’s fine; I always prefer my city builders to be sandbox-orientated anyway. I’m still so fresh into the game that I’m not sure just how well balanced everything is, and if it will be possible to build cities in a number of different ways to suit your own tastes and strategies. What I do know is that the console version of the game has been tuned so that the controller inputs work really well with it (I’ve not had any issues with the user interface at all, in fact). The other key thing to note is that this game really is gorgeous. The alien landscapes are rendered stunningly, and there’s a real joy in watching the city of pods and walkways slowly build up. 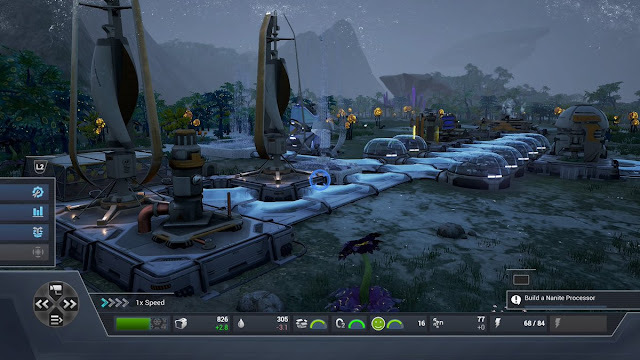 It’s possible to zoom really close in to watch people milling about, and I would have liked for them to do more than wander back and forth (have a conversation with your fellow colonists once in a while!). That said, the level of detail when zoomed close in is quite impressive too. Aven Colony is in full release later next month, but there’s no doubt in my mind that it will end up being one of my most played games this year. It’s a slight variation from a standard city builder, and, really, that's all I need to have a heck of a time.